The central Entercom tower, a fixture in Westwood for nearly 85 years, will come down next week, weather permitting. It was November 25, 1933, when the first radio signals were broadcast from the massive radio tower installed on unincorporated property at what is now 50th Street and Belinder in Westwood. Next week, that tower will be no longer. A tower crew will begin disassembling the structure next Tuesday, May 2, to ready the site for redevelopment as a new home for Westwood View Elementary. 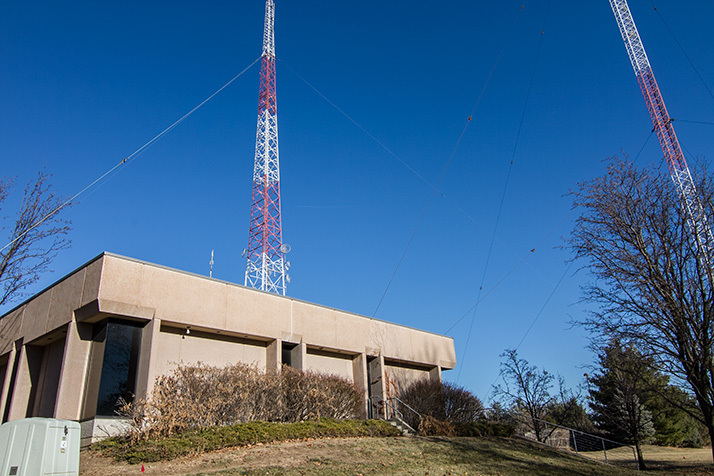 The Shawnee Mission School District purchased the property from Entercom last spring with the intent of constructing a new elementary school building there to replace the aging current structure a couple of blocks away. In a message to Westwood residents on Thursday, Mayor John Yé hailed the move as both historic and positive for the community. Construction crews will begin by attaching an apparatus below the top portion of the tower, which they will use to dismantle the structure a section at a time. The removal process is contingent on weather. Should the crews have unabated access to the tower, removal could be completed in as soon as five days from the start of the process. Crews will also remove the concrete foundations that housed the support cables once the tower is removed. The smaller, secondary tower will remain on site until sometime next year.